Stools - LIVING AND CO.
Beautiful Bloomingville Haze stool. This Bloomingville Haze stool is made of black rattan. 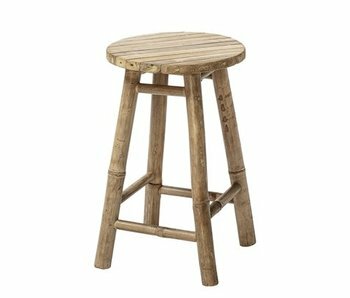 The height of the stool is 47 cm and diameter 35 cm. Nice combined with the other items from the new Bloomingville collection! Beautiful Bloomingville Birdie footstool. This Bloomingville Birdie footstool is made of green polyester and has a black metal frame. Nice combined with the other items from the new Bloomingville collection! Beautiful Bloomingville Fly stool. This Bloomingville Fly stool is made of green polyester and has a black metal frame. The height of the stool is 45cm. Nice combined with the other items from the new Bloomingville collection! Beautiful Bloomingville Sole outdoor stool. This Bloomingville Sole stool is specially designed for outdoor use! The frame is made of bamboo which ensures a durable product. Beautiful In Stool stool from the atmosphere maker from Denmark. The Bloomingville In Stool stool is made of a concrete top and has a wooden frame. Nice combined with a vase of flowers! Can also be used as a side table. Perfect relaxing with this Dom rattan stool from Danish Bloomingville. The stool has beautiful playful shapes and is very firmly by the strong rattan and black metal frame. Combines well with the Bloomingville Dom rattan chair. Beautiful oak stool from Danish brand Bloomingville. The stool has a strong oak frame with a wonderfully comfortable pillow. Nice to use in a large hall or at the dining table. A highlight from the new Bloomingville collection. What a wonderful stool for at the dining table! This metal stool by Danish maker Bloomingville is a real eye catcher. 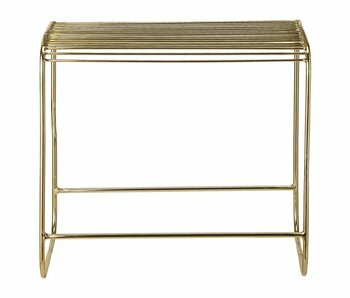 The stool has a strong metal frame and can be used out of doors. Easy to combine a modern interior!